Your story matters, and it also doesn’t matter. It doesn’t matter because it’s done and cannot be changed. No matter how much effort you put into rewriting the story in your mind, to yourself and to anyone who will listen—it will not change. It would be fabulous if we could rewrite history by the passion of our retelling, ever so slightly tweaking what really happened, to justify to ourselves how often we made a wrong turn, a bad choice, lost stuff, hurt people and missed opportunities. We can’t and there is no value in reliving it over and over, dredging it up and brooding on what has been. Every misadventure, every win and every loss, has woven the fabric that is your unique self. 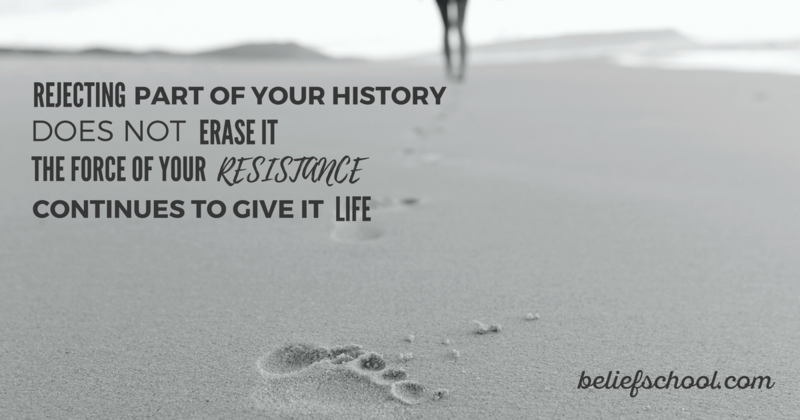 Rejecting part of your history or feeling any kind of shame, does not erase it—it actually gives it a starring role in creating who you are, as the energy and force of your resistance silently direct the choices you make. The place where your story belongs is in your archives—to reference for understanding and illumination but for nothing else. Where your story does matter, is in your quest for enlightenment. It can’t be whitewashed though; it must be an examination of the truth as accurately as possible, no matter how painful it is, if you want good to come of it. From the moment you could take in the world you started creating a set of beliefs about yourself and the world around you, these beliefs have become the foundational code that directs all of your decisions. What beliefs have been born out of your story that are now defining you? This is not a simple question and requires some deep thinking and a gargantuan amount of honesty. You do not need to tell this to anyone; this is a conversation for you to have with yourself. A conversation that must be had if you are to stop being defined by your past and start to write your own story. I encourage you to journal on this question, not to chew on past hurts or keep retelling your story to yourself, but to dig for understanding and meaning.